*Add the Milwaukee 49-22-1110 Sawzall Thin Kerf Blade Set to your cart and the free item will automatically be added. Limit 2 free items per customer. Offer valid until 11:59pm ET on April 30, 2019 or while supplies last. No adjustments to previous purchases. Subject to change without notice. 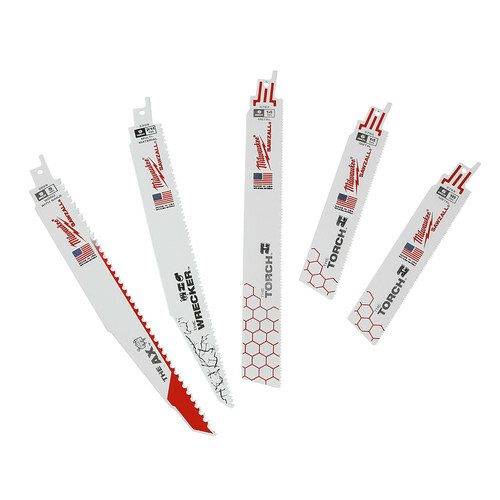 The Milwaukee 10 piece Sawzall blade set features an assortment of standard wood and metal cutting Sawzall blades for a broad range of professional applications. The set includes two 6 in. wood cutting blades for increased control, one 9 in. wood cutting blade for greater cutting capacity, three 6 in. 14 TPI blades for medium to thick metal cutting, three 6 in. 24 TPI blades for thin metal cutting. and one 9 in. 18 TPI Blade for medium metal cutting. The set also includes a durable job site case for convenient blade storage.